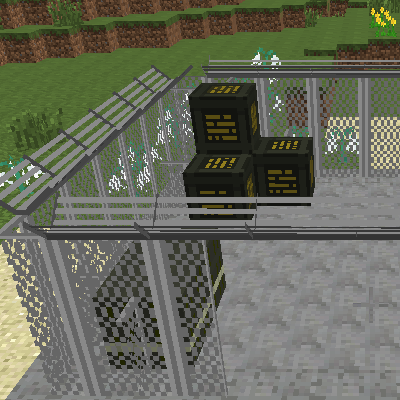 Military base decor is themed towards providing blocks and items to help style military bases in Minecraft. The following tech eras are primarily based on U.S. military history due to most developers being American. Attempts will be made to reflect other nations and their own style. However, a majority of the content will be based on American based decorations, equipment, and bases. As well those of nations that the U.S. has fought with or against since it's creation. Disclaimer: Dates to not reflect actual duration of wars, timelines, or ears. Rather time frames have been designed to fit the most content per module. While at the same time ensuring styles of similar techs are keep together. An example of this is including the Korean war with WWII equipment due to both using similar technology. I'm official marking the mod as dead, this means it will not receive any support. The mod will only be removed from this state if I find another developer or figure out how we can maintain the mod with our current resources. We are also open to allowing forks of the project to be made. However, would like to talk to anyone before this happens. That way we can figure out the best way to proceed. As honestly the mod is a mess and needs a lot of work. Also as a side note, I will take a look at this mod again after the new year. Likely February or march to see if we can continue the mod. The current though is to restart from scratch and built the mod out as small theme mods. Rather than doing what we tried with a ton of config driven modules. A) That is not how you get support for a mod. We need to know more than the game failed. Such as crash logs, game logs, steps taken to get to that point, other mods installed, version of the mod, and so on. B) The mod is not currently being developed. So even if you did the above there is no one to work on it. Hennamann was the only developer doing work on the mod. its because i'm in the process of making a modpack with a magic theme with ruins from wars/battles and have defensive buildings. any chance of a stable release? Rewrite for 1.12 is in progress by Hennamann and almost ready for release. Awesome stuff, I'm making a mod setup/modpack that will be zombie apocalypse based, so this mod would be absolutely perfect. If it's testable, I'd love to beta test it, to pick out any stubborn bugs. The mod is still in progress. There are plans to add more models to the fence toppers to allow for proper cornering. So I just found that ICBM and its developers are making a lot more mods than I knew. My only problem with this fact is that they are still updating the 1.7.10 branch. I guess that it is time for me to return to 1.7.10. The pack I am developing for 1.10.2 will have to wait. edit: Thank you guys for actually using the images tab. not enough developers use that in my opinion. We do have plans on updating to the later versions of minecraft just no ETA at this point in time. Also bug reports go to https://github.com/BuiltBrokenModding/MilitaryBaseDecor/issues and not the comment section. I found the issue and fixed it. Just need to wait for the Latest VoltzEngine to be approved and it will work fine. That is what it was. I fixed it in the Latest VoltzEngine i switched to beta.